What Is a Portable Projection Screen? A portable projector screen can be set up virtually anywhere. A portable projection screen allows people to set up a projector at any location, for events like outdoor film screenings or classroom presentations. The screen breaks down into compact components for easy transport between sites. It comes with a support system to hold it up and anchor it in place. Many designs are available through suppliers of presentation and projection equipment. One common configuration consists of a tripod stand with a screen clipped to the top. The user can roll up the screen when not in use and fold it against the stand, which collapses to make it easy to carry. When it is time to set up for a presentation, the stand can be unfolded and the screen can be pulled down and clipped to the base to tighten it. Another option is an inflatable projection screen with tethers to keep it stable in the wind. Most configurations have a weight at the bottom to keep it steady. 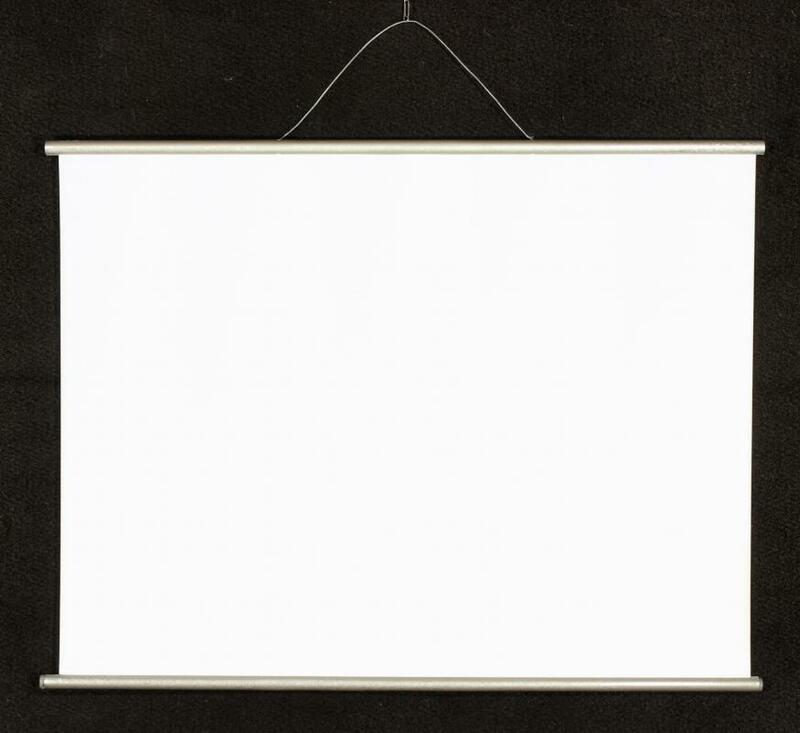 The portable projection screen may be white, off-white, or gray. The best background can vary, depending on the settings where it will be used. Lighting conditions can sometimes make it hard to see images projected on a screen if it is the wrong color or when positioned poorly. A projector technician can determine the best type of screen to use and the most optimal placement. Generally, the light needs to be dim, with no bright light sources immediately around the projector, as these may interfere with the picture. Rear projection screens allow people to project images against the screen from behind. Their supportive frames cannot run behind the screen or they will interfere with the image. Front projection uses an image cast against the screen from the front, in which case struts and other supports will not be visible. The best configuration for a portable projection screen can depend on where it will be used and what kind of projector is available. It is possible to rent a portable projection screen for an event, if the cost of ownership is prohibitive. Some facilities rent screens and projectors and can provide a technician for an additional fee. Leases are available for more long term needs. For facilities that need to buy a portable projection screen, a used product can be an option to keep costs down. It is important to inspect used screens for rips, tears, or missing components before making a purchase. What Are the Best Tips for Making a DIY Projection Screen? What Are the Different Types of Projection Screens? How Do I Choose the Best Portable Digital Projector? What is a Front Projection Screen? What is a Movie Screen? What is a Portable Projector? What is a Projector Screen? @pastanaga - We have quite a large botanic garden near us and every year they have a summer festival where they play movies on a portable projection screen as well. But, they also use them for other things. They put on a big light festival each year, and sometimes artists project films, or even just colored lights on a projection screen that's been set in the trees. One year they had one set up displaying a program that registered your shadow, so you could interact with the image on the screen! That was pretty awesome. The kids had a ball with it as well. They have a portable projection screen at my local park and occasionally they bring it out for summer festivals and the like so they can screen old movies. It's not very big, but often quite a few people come to see the movie, especially if it's something like the Sound of Music, which they played last year. I don't know what it is about watching a movie outdoors with a crowd of people around, but it is lovely, and the atmosphere is always very friendly. I try not to miss it whenever they hold it. I hope they manage to get a bigger projection screen at some point though. So many people go to it nowadays that it is a little difficult to see.